Artist Chris Troutman will have his work on display at the College of Southern Maryland Tony Hungerford Memorial Art Gallery from Nov. 19 to Dec. 13, 2018. The gallery is in the CSM Fine Arts Center, FA Building at 8730 Mitchell Road in La Plata. Mr. Troutman’s exhibit is titled Time and Line: Drawing and Narrative. Troutman draws human figures in contemporary urban settings, shown from unexpected vantage points. The gallery is open Monday through Friday from 9 am to 9 pm, and then Saturday from 10 am to 6 pm. In an artist’s statement, Troutman said he focuses on drawing as his primary medium for his studio research. “Typically, I collect source materials from direct observation or photographs, which I synthesize in compositional exercises as sketches that lead to final works,” he said in his statement, listed on the CSM website. Troutman said he starts his drawings as marks and lines, without preparatory compositional sketches. Mr. Troutman said he focuses on people in contemporary urban settings, presenting them from unexpected vantage points. Troutman created large-scale drawings without frames or glass, which he says brings the artwork into the viewer’s space and allows the viewer to see the process each drawing has undergone. 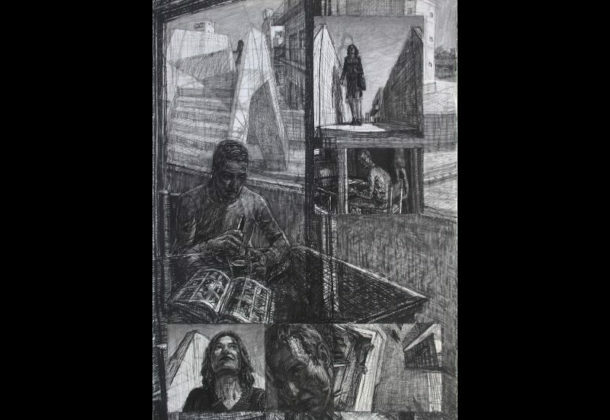 “The scale of the drawings, the figures within them, as well as composition and point of view, place the audience in unexpected, and sometimes overwhelming, spaces, enabling the resonant experiences from which the drawings are inspired achieve a similar resonance with viewers,” he said.